Is it Important to Fix Baby Teeth Cavities? Everyone remembers the first time they discover a loose tooth as a child. For some, it’s an exciting experience, and for others, it’s definitely strange. Losing that first set of teeth is part of growing up, but does it mean that these baby teeth are less important than your adult teeth? If your child’s baby teeth were to have cavities, would it even be worth fixing them? Absolutely, and for a couple of reasons. Cavities are the first sign that things might be going awry with your oral health, and they can indicate the need for additional treatment. Further, childhood cavity development can signal future health risks. 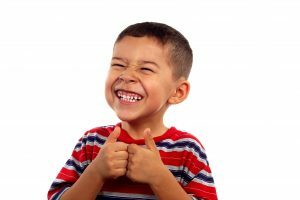 When your dentist evaluates your child’s teeth and notices a cavity, the examination doesn’t end there. The presence of one cavity will prompt your dentist to look for other cavities, or areas of plaque buildup that may be on the verge of producing a cavity. Further, your dentist will also look for signs of gum disease. Bacteria can work their way into all kinds of oral tissues and cause problems. While your child will eventually lose their baby teeth, the bacteria causing cavities can still cause other long-term problems. Your genetics have a lot to do with how likely you are to develop a cavity. If your child is constantly having to fight cavities and plaque formation, it can signal that he or she may be genetically predisposed to cavity formation. That information is important to have as your child gets older and has to schedule his or her own dentist appointments. Everyone’s oral health care routine may need to look a little different, depending on how likely you are to experience cavity formation. Of course, the best course of action is to prevent cavities from ever forming on your child’s baby teeth. The best way to do that is by scheduling their biannual dentist appointments. These examinations allow the dentist to check for plaque and cavity formation, thoroughly clean your child’s teeth, and recommend preventive treatment. Options like fluoride rinse and dental sealants can fortify your child’s teeth and prevent cavity formation in difficult-to-reach areas of the mouth. When you help your child care for their baby teeth, you set them up for a bright oral health future. Cedar Dental welcomes patients of all ages for quality dental care. Our team believes that building strong oral health habits as a child will help your little one avoid cavities and other issues in the future. Schedule a checkup and cleaning for your child at Cedar Dental in Cedar Rapids, IA by calling 319-364-7108.